Nobody believes that a picture is worth a thousand words more than today's Web designers, as evidenced by the increasingly visual nature of the Internet. In fact, it's not difficult to stumble onto a home page these days composed of nothing but graphics (see Figure 5-1). Some Web sites rely almost exclusively on graphics for both looks and function. 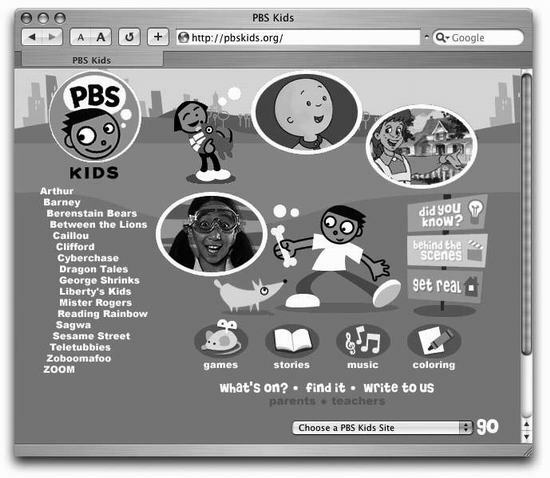 The home page for the PBS Kids Web site, for instance, uses graphics not just for pictures of their shows' characters, but also for the page's background and navigation buttons.